When I told my mum about the albums I would be listening to for this blog series, the first thing she said was ‘You will LOVE the Eagles albums’. After hearing Their Greatest Hits 1971-1975 I totally understand. This is totally my kind of country music, smooth as anything; stacked with harmonies and honesty while being genuinely fun at times. As a singular record, Their Greatest Hits is so tightly packaged that it may as well be its own ‘All killer, no filler’ album. Opener Take It Easy sums up the laid back California attitude of Eagles; country rock shouldn’t be a hard thing to listen to. Side A is especially hit filled, the singalong of the chorus on Lyin’ Eyes stands next to the infectiously catchy Already Gone. It’s the sort of country rock that I literally listen to in 2017, the likes of Little Big Town, Lady Antebellum and Miranda Lambert have built their sound around songs like this. Their Greatest Hits was for a long time the all time biggest selling album in the US, while here in the UK it has sold a measly 300k copies to date. The only comparison that comes to mind is the album that sits at the top of the UK list. Both Eagles and Queen seemed to have a similar trajectory and peaked with their debut greatest hits collection and both LPs remain an important landmark in their respective territory’s music history. It feels great to listen to a Greatest Hits set of an act you’ve never heard before and come away understanding exactly why it’s one of the world’s all time best sellers. Will I listen again? : Probably yes. Best Track: Already Gone was the standout for me, though as a hits collection there’s a number of great tracks here. 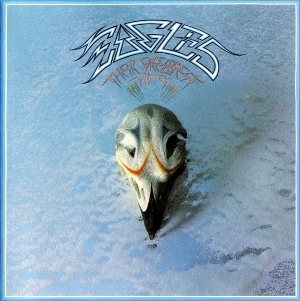 Tags: Eagles, The World's Greatest Hits, Their Greatest Hits (1971-1975). Bookmark the permalink.